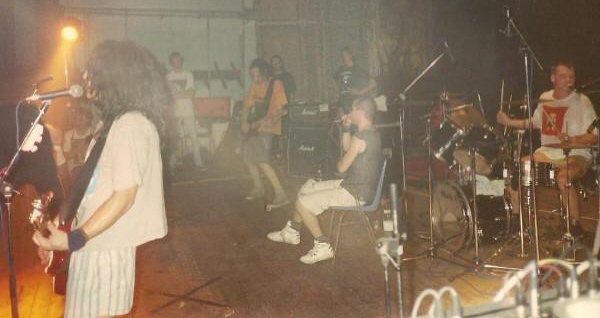 We were back 5 months after the first tour [see: Netwerk, Aalst, 3 mar 90 (Hell’s Kitchen)] and played with ‘Spermbirds’, they were great guys. This show was big fun for us. 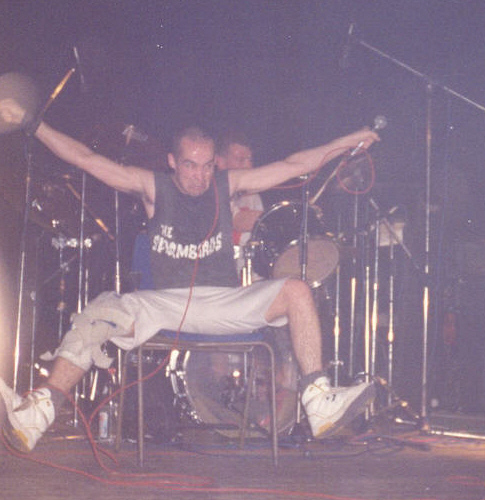 I was nursing a bad knee from a mid-air collision with Troy @ Gilman street earlier that year, I was totting around that knee-brace on the first European tour, so when Lee hurt his knee at this show I broke out that brace but Lee chose the chair for support over trusting my brace. ‘Knee Brace the 7 Deadly Sin’. Hahahaha! It’s in one of the songs on ‘Fistful of Chicken’, the line was “Embrace the 7 deadly sins, somebody loses somebody wins”. I t was a running joke within the band. Yeah, I still wore that thing on stage as a reminder. Weird System was the record-label that put out Fistful Of Chicken. 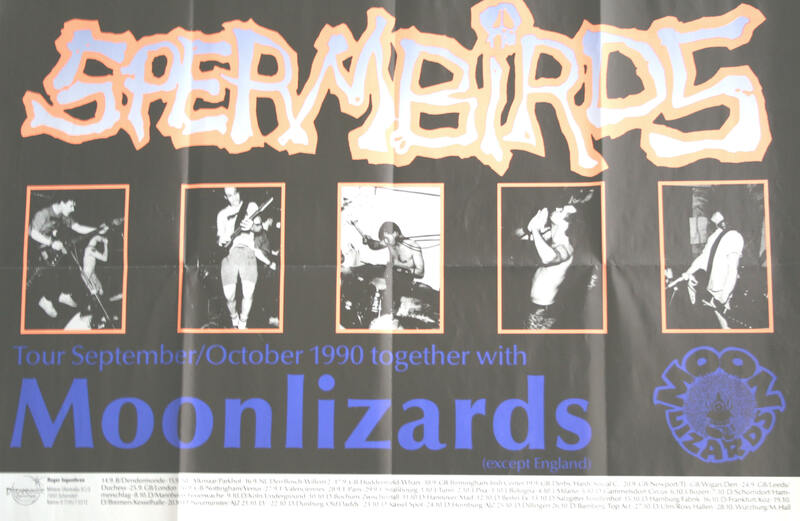 Gosh…a 1990 gig with the ‘Spermbirds’ in Belgium… The tour was booked by Doug Karin (an American with an Italian girlfriend) who is currently missing in action as far as I can tell. It was booked starting and ending in Rome on our tour ‘All Roads Lead To Rome’. Fitzjoy (I believe a Belgian guy) was the roadie and van-driver and we piled into his older classic euro van for a 30 day tour. 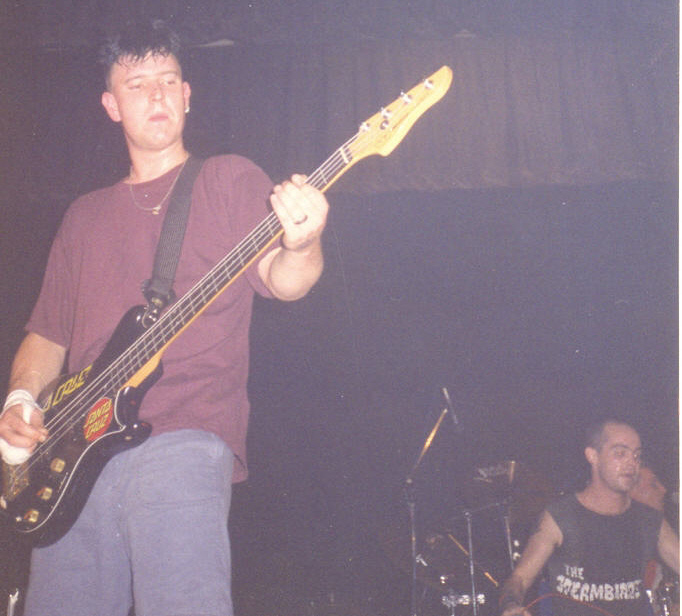 The ‘M.D.C.’ line-up was with Matt Freeman of ‘Operation Ivy’/’Rancid’ [bass] fame, with Bill Collins [guitar] of the East Bay California scene and with Al Shvitz on drums and me on vocals. I remember very little of the show except that it happened. Belgium, in the 1980s and early 1990s, was sadly always a mystery to me… It wasn’t ‘til the 2000s tours that I really focused on Belgium, realized there was a Gent and that there was a Lintfabriek. I do remember that the Belgium gigs were always friendly as were the accommodations. Things started difficult with the tour because the van broke down in the South of France, someone had to come down there with another one. But we managed to keep everything going. The day of this last gig for them, I started working in Netwerk at 11 a.m. (building the stage, setting up the PA,…). I was already tired when the first people entered. 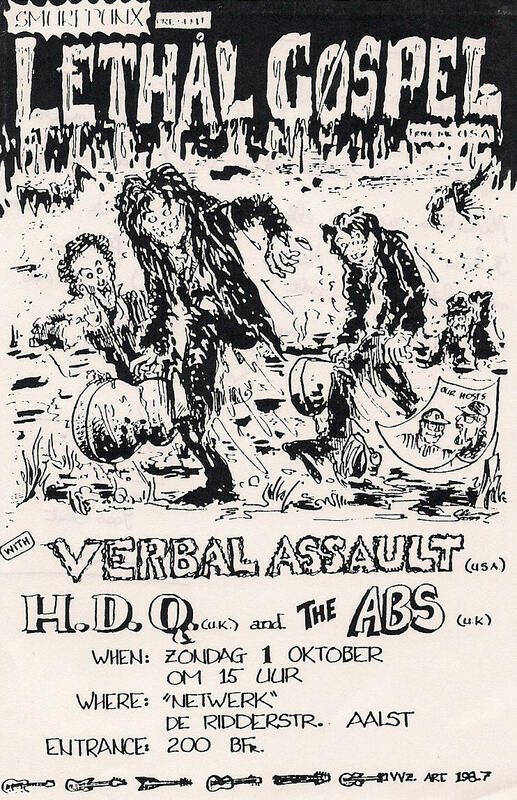 I got stressy when ‘H.D.Q.’ phoned they had a flat tire: ‘The Abs’ came along with them and they were meant to start playing at 3 p.m. (they arrived at 5!). They both made that up with very good sets. Also ‘Verbal Assault’ were fantastic. Finally ‘L.G.’ hit the stage and they overwhelmed the crowd even though they were a bit affected by the tiredness. I spent the night in our ‘Gele’ pub where ‘The Abs’ and ‘H.D.Q.’ slept. It was rather late when we hit the sack: there was a lot to talk about (nice blokes!). 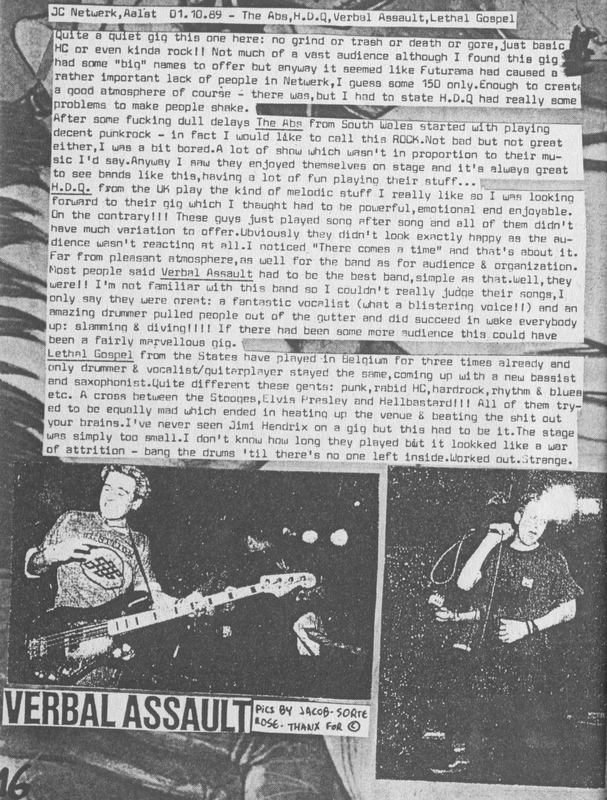 The next morning I went to wave ‘L.G.’ goodbye at the airport, drove home and collapsed… We didn’t loose any money; the crowd was big enough even though 50 km away ‘Bad Brains’ and ‘Hard-Ons’ were playing. 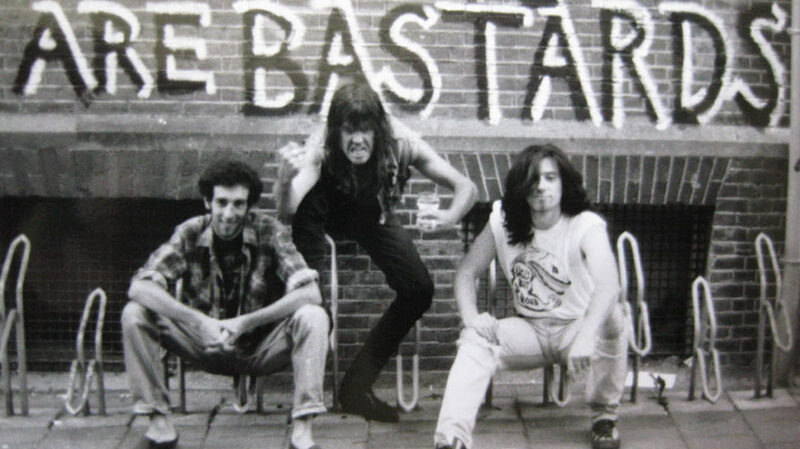 ‘The Abs’ had a mini-Lp out entitled Mentalenema. ‘Fatty Ashtray’ Jon Simpson played the bass on that. The others were Barrie ‘Baz’/‘Boggs’ Oldfield (guitar & vocals) and his brother John (a.k.a. 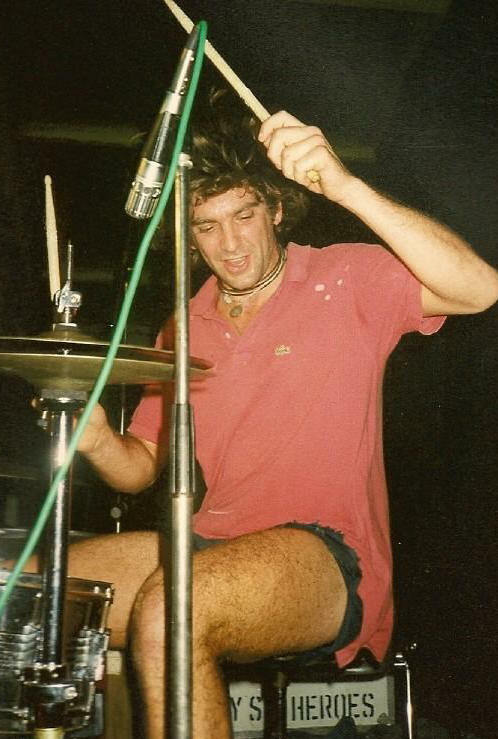 ‘The Rev’, ‘The Reverend’, ‘Rev John D’; drums.). ‘B. 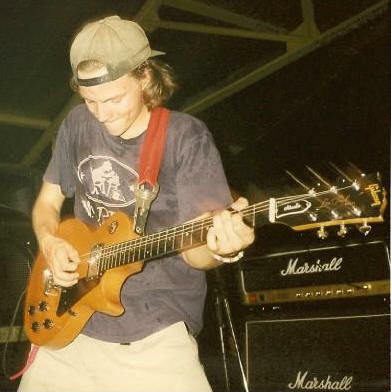 Funnunyon’ Bryn Jones played guitar. 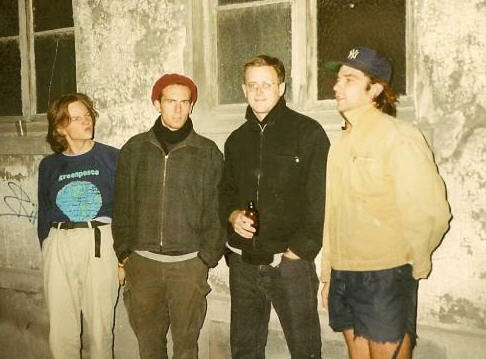 The summer before the ‘L.G.’ tour Mokka & me visited the band in San Francisco. Of course we visited/met lots of HC-related places/people (e.g. 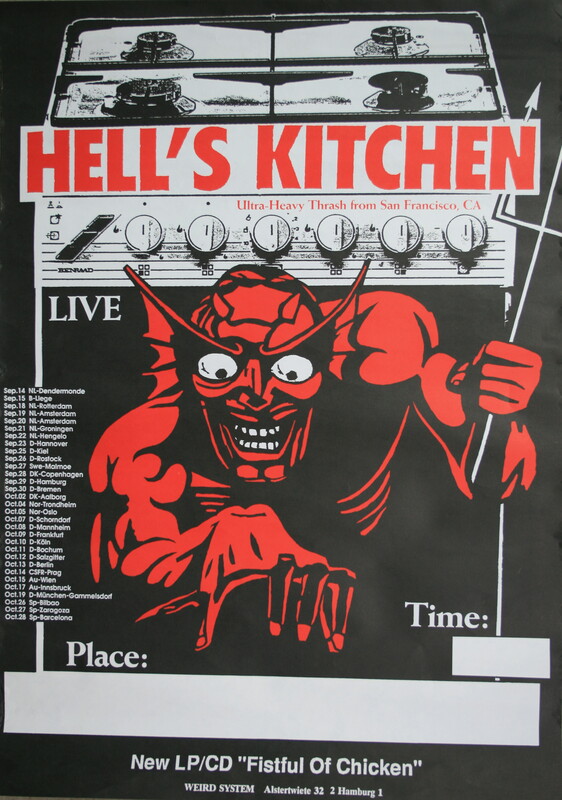 Gilman Street, MRR House, Blacklist, Mordam, the ‘Yeastie Girlz’, Dave MDC, Daisy Anarchy, ‘Libido Boyz’, ‘Moral Crux’, Martin Sprouse, Murray Bowles, Tim Yo, ‘Swiz ‘, etc. etc.) 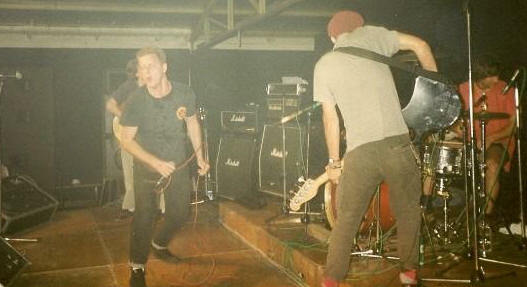 and gigs (other bands we saw: ‘Toxic Reasons’, ‘American Standard’, ‘Jawbreaker’, etc.). One of them was in a squat where ‘Verbal Assault’, ‘Neurosis’ and ‘Econochrist’ played (and where I met Kent McClard), so I already knew what a superb band ‘V.A.’ was… The guys were a bit introvert but they said they’d played one of their best concerts and appreciated the reactions from the audience very much. Sad to say, I don’t really remember that show…but hey, it’s been 20+ years! 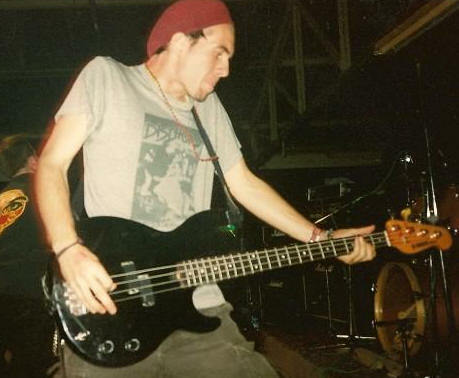 Anyway, we always had a great time in Europe; and ‘H.D.Q.’ was a cool band, so I’m sure it was a good gig… The picture of our bass-player is actually Darren Mock, not Dylan Roy. 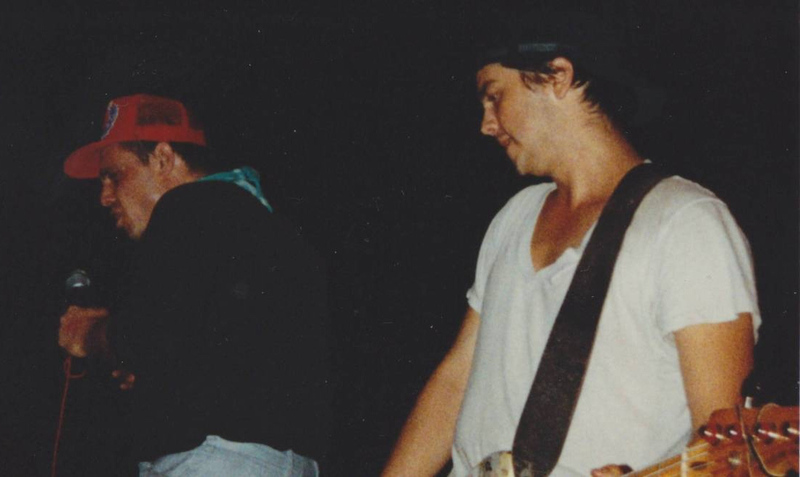 Darren was in ‘V.A.’ for both European tours – Dylan played on the majority of our recordings. I believe we hooked up with Konkurrent (and Hetty, who was basically running it) because they/she worked with Dolf Hermanstädter from Trust fanzine. 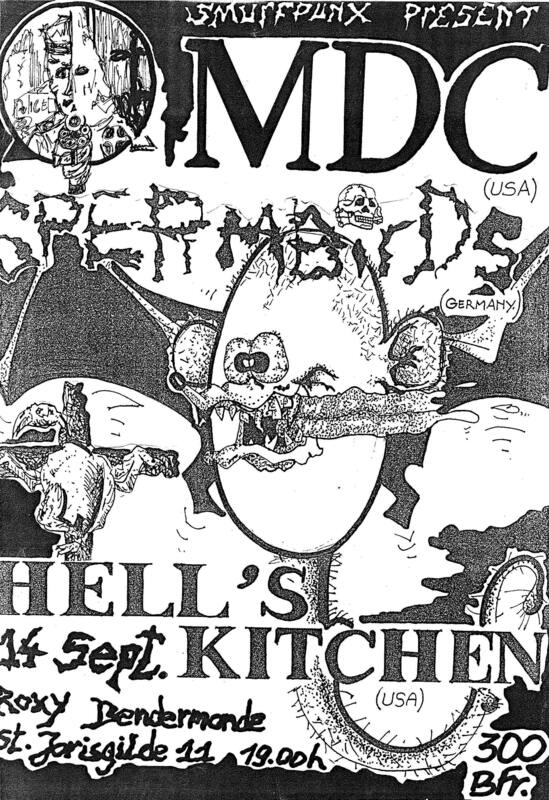 This show here, in Belgium, happened, if I remember correctly, near the end of our first tour, after we got back from the UK (where we hooked up with ‘H.D.Q.’). Chris is more senile than even I am. 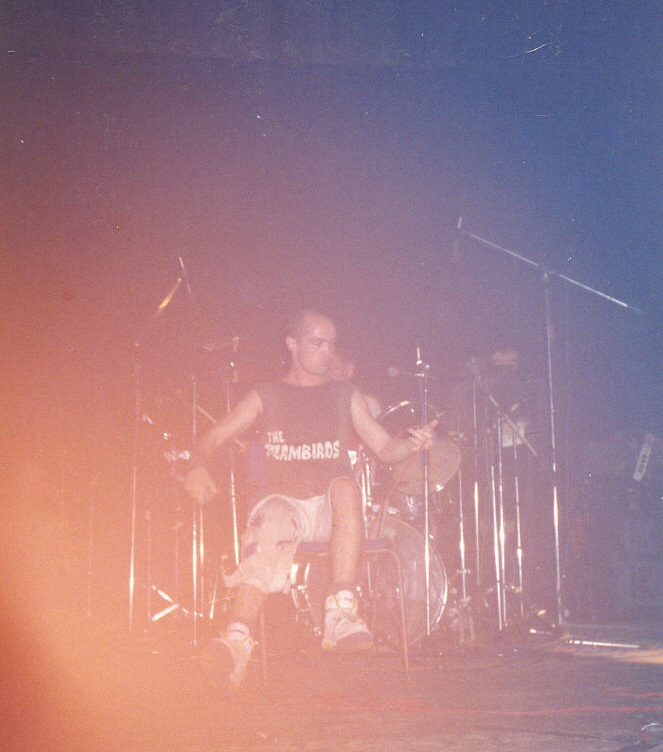 This concert was near the beginning of our second European Tour. It was a little bit similar to our only show in Belgium the year before as we rushed in and out and barely got much time to hang out. If my memory is correct, we were pretty late in arriving to this show and had to leave very quickly for another show. Of all the countries we played shows in, we probably spent the least amount of time in Belgium (due to having to travel). I remember being blown away by all the old architecture and regretting not ever having time to walk around. From reading your post I remember ‘H.D.Q.’s flat tire followed by some general chaos as the show was pushed back later and later. Did we (‘V.A.’) end up playing first while someone went to rescue ‘H.D.Q.’? 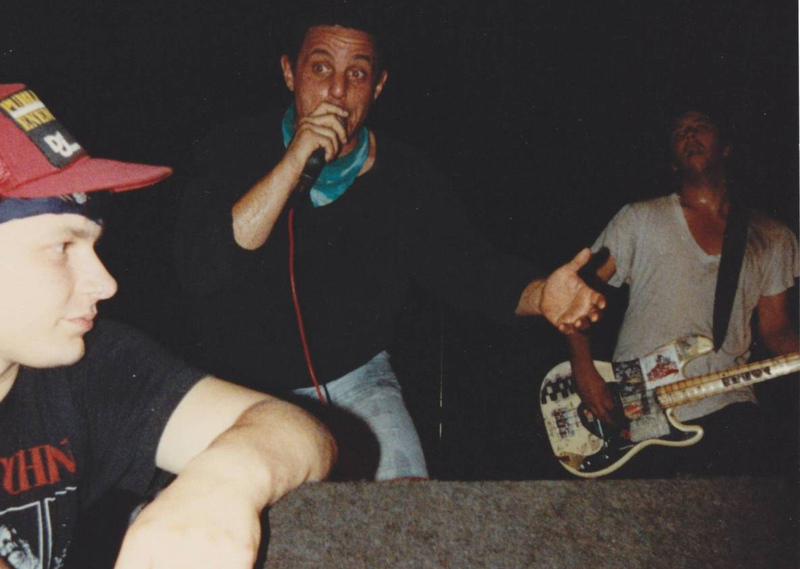 Whenever ‘H.D.Q.’ showed up, I recall them pretty much walking right on stage and completely rocking. They were really good dudes. I can’t exactly recall how we (‘V.A.’) did. Good, I hope. Thanks for having us 20+ years ago!